This Robin Swicord adaptation of Luisa May Alcott’s classic novel is very good, considering that the movie comes in under two hours. I will not detail the story itself as that is already covered in my review of Little Women in my book section. Briefly, including spoilers, this is the story of the March sisters, ranging in age from 12 to 16 at the beginning of the novel, living with their mother in Cambridge, MA during and immediately after the Civil War. Their father is a pastor to Union soldiers during the conflict. The central character, Jo, aspires to become an author and she befriends a wealthy boy, Laurie (Teddy), who lives nearby. As they grow up, her older sister, Meg, marries Laurie’s tutor, father returns home, younger sister Beth dies of a heart problem carried over from scarlet fever, and Amy grows up. When Laurie finishes college, he proposes to Jo, but she turns him down, so Laurie goes with his grandfather to Europe, where he dissipates, while Jo moves to New York to become a governess. Amy goes to France with their Aunt March, where she meets Laurie. As Jo falls in love with a new acquaintance, Professor Bhaer, Laurie fall in love with Amy and marries her. This film features a superb young cast. Wynona Ryder stars as Jo and she carries off the girl’s naiveté and yearning with a youthful vigor that is completely believable. Young Christian Bale is perfect as Laurie. Amy is played by two actresses: Kirsten Dunst plays Amy as a girl and Samantha Mathis plays her as a young woman. Although both of them are good, there are several problems with the arrangement. First, they don’t look enough alike to be believable as the same person and second, by jumping four years into the future, the film does not let us see Amy grow and change, so the character differences between the two Amys is stark and does not feel natural. The script completely leaves out how Amy replaced Jo as a companion for Aunt March, leading to changes. It does not let us see how Jo offended Aunt March, which was what led to the Aunt taking Amy to France instead of Jo. Trini Alvarado as Meg and Eric Stoltz as John Brooke, the man she marries, are both very good and Susan Sarandon is perfect as the mother of the girls, Marmee. Clare Danes sometimes shines as Beth. The scene where Mr. Laurence presents her with the piano is excellent, although the film doesn’t take the time to show her practicing on the piano at the Laurences, which is part of what makes the gift so special. However, during the scene where Beth dies, director Gillian Armstrong allows Danes to play the scene with a certain fear and regret of death, whereas in the book, Beth embraces her death. Beth’s character is built around her being a homebody and so certain of Heaven that she dies with a kind of splendid peace. Danes performance negates the character she has so carefully built. One of the things the movie didn’t do as well as the book was the scene where Laurie proposes to Jo and she refuses him. It is probably the best scene in the novel and it seems to flounder a bit in the film, so that what should be a major crisis on which the story pivots just doesn’t bring the heat. However, the movie clearly improves on the book with the character of Professor Bhaer. As played by Gabriel Byrne, he is more romantic and open-minded, certainly clean-shaven. This redrawing of the character to make him more likable is connected to a new ending that makes the story work much better. In the book, Bhaer goes into a fit over Jo writing sensational stories for yellow press and she gives up writing entirely, but in the movie, he merely feels that she should write from her own heart and do better. 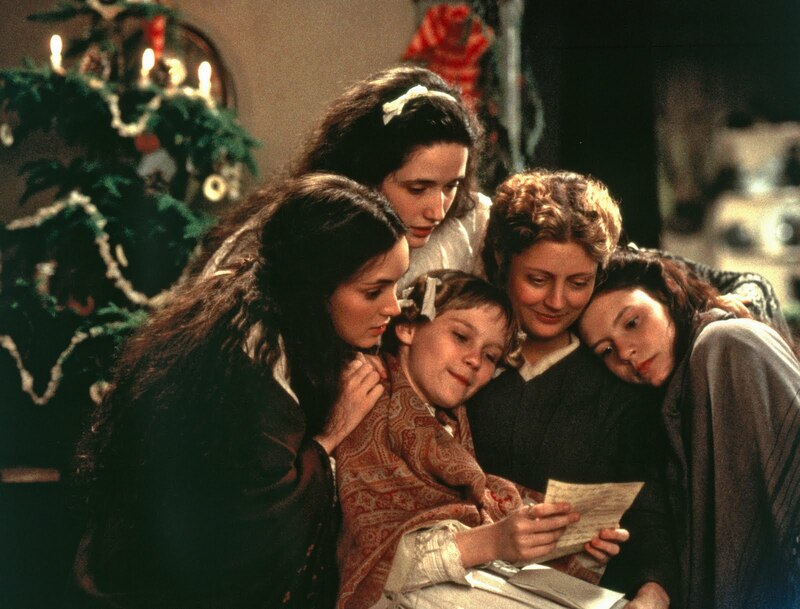 Following Beth’s death, Jo, in the movie, proceeds to write a novel about her own family and that novel then becomes Little Women and gives us a real parallel with Luisa May Alcott, who wrote the book originally about her own family. Bhaer then finds a publisher and delivers the galleys to Jo, which is how they get together. This ending is so much more satisfactory than the novel. It is unreal that Jo would give up writing for good and it feels entirely wrong that she would marry such a closed-minded old fool as Bhaer in the book. One more improvement really gives the movie a lift over the novel. Throughout the book, Alcott preaches to her readers, giving many little examples of how girls can make their own family lives better if they only behave properly and completely trust in God. The movie removes almost every single instance of preaching and tells the story without a moral hammer. Overall, it is a very good film. This is the fifth adaptation of Little Women to the screen. There were two silent versions, in 1917 and 1918, a film in 1933 directed by George Cukor with young Kathryn Hepburn as Jo, and one again in 1949 with June Allyson as the main character, but also featuring Janet Leigh, Elizabeth Taylor, and Margaret O’Brien. The 1949 version is the only other one I’ve seen and it is also very good, but for modern viewers I would not hesitate to recommend this 1994 movie with Wynona Ryder. It is a solid adaptation, well directed and–for the most part–very well acted.